The era known as the Industrial Revolution was a period of fundamental changes in agriculture, manufacturing, transportation, and social structure. Beginning in England, this period was a true “revolution,” for it thoroughly destroyed the old manner of doing things. An economy based on manual labor and skilled artisans was replaced by one dominated by industry, machinery, and mass production. Energy was a major impetus for this conversion from an agricultural society to an industrial one. Animal and human power were the primary sources of energy until James Watt perfected the steam engine in 1775. The introduction of steam powered machinery (fueled by coal) opened the door to dramatic increases in production, and in the manufacture of more machines. Conditions that promoted the Industrial Revolution were advances in agricultural techniques and practices resulting in an increased supply of food and raw materials. Changes in technology and industrial organization resulted in increased production, efficiency, and profits. The building of roads, canals, and eventually railways enabled expanded trade. Many of these conditions were so closely interrelated that increased activity in one spurred an increase in activity in another. Although the Industrial Revolution first occurred in England, it was a radical time of social and economic change in America and most of Europe as well. I found this video recently on Youtube – but there are no credits (and it has a smarmy musical background). Even so, it’s an excellent documentary of book making prior to the Industrial Revolution — just watch it without sound. The long reign of Victoria, who became queen of England and Ireland in 1837, spanned most of the nineteenth century. The Victorian era is often defined as the years from 1837 to 1901, Queen Victoria’s period in office. The momentum of the industrial revolution had already begun, but it was during the Victorian era that the full effects of industrialization made itself felt. Along with technological breakthroughs, the Industrial Revolution brought crime, urban poverty, and the rise of a self-indulgent nouveau riche (newly rich) class. Wealth became a motivating cultural force. As the desire for unlimited comfort spread from the wealthy to the new middle class, a taste for ornamentation and ostentation became the dominant style. Extravagant embellishment was applied to architecture, furniture, clothing, and appeared as elaborate borders and lettering in graphic design. Sentimentality, nostalgia, and idealized beauty were expressed through printed images of young women, flowers, children, and puppies and kittens. In 1851 the Queen’s husband, Prince Albert, hosted a Great Exhibition with 13,000 exhibitors from all industrial nations. It attracted over 6 million visitors and was the showcase of technology and design at the height of the Industrial Revolution. Lithographic printing was developed in Germany in 1796 by Alois Senefelder. Lithography is a printing technique that allows multiple reproductions of an image drawn with greasy crayon on a certain type of limestone. When the naturally absorbant stone is wetted before printing, the printing ink will be retained in areas containing grease and repelled in all other areas. The characteristic of this printing technique lies in the fact that the image area and the non-image area react differently to the presence of ink. Lithography joined the older techniques of relief and intaglio printing and greatly expanded the range of what could be printed. One of the technologies exhibited at the Great Exhibition of 1851 (also known as the Crystal Palace Exhibition) was the new method of color printing: chromolithography. Although lithography had become widespread, it was initially a single-color printing method. Early experiments with color lithography were perfected in 1837 when a French printer patented a process named chromolithography. After analyzing the colors contained within the original subject, the printer separated them into a series of printing plates and printed these component colors one by one. The beauty of this process is due to the talented artists who created the original designs, frequently in watercolor, and the skilled craftsmen who traced the original art onto lithographic stones. Many images required five, ten, twenty, or even more colors. Colored inks applied to these stones came together in perfect registration, recreating hundreds or thousands of glowing duplicates of the original. The lithography firm, rather than the individual artists or craftsmen was credited on chromolithographs, and the names of many of those artists are lost to history. The arrival of color printing had vast social and economic ramifications. The ancient printing technique of movable type had, until then, restricted design to an inflexible grid: Anything that was to be printed had to adhere to a system whereby type was set in consecutive rows of parallel lines. Illustrations, maps and the like were hand drawn and engraved. Lithography set type and layout free. From art reproductions to advertising graphics, color printing poured from the presses in the millions. But admirers of fine typography were appalled that the design was done on the artist’s drawing board – without training in printing and type traditions, designers could invent any letterform that suited their fancy. Punch and Harpers New Monthly Magazine opened the era of the magazine when they began publication in 1841 and 1850, respectively. Both used many woodcut or engraved illustrations and metal type. The rising tide of literacy, plunging production costs, and the growth of advertising revenues pushed the number of newspapers and magazines published in the US from 800 to 5,000 between 1830 and 1860. Closely bound to the growth of magazines was the development of advertising agencies. The first true ad agency opened in 1841 in Philadelphia. The surpluses of goods created by the Industrial Revolution led to increased competition in the marketplace, as sellers sought to educate buyers to the virtues of products and services. To this end, advancements in the simultaneous printing of text and image fostered the new medium called advertising. Victorian commercial printed matter was characterized by the era’s pervasive ornamentation and careless craftsmanship. If a compositor lacked a lower-case g, for example, he would not hesitate to use an upside-down b in its place. Sometimes however, a merchant’s demand for distinctive announcements did result in truly original display faces, composed of odd, and even ingenious woodblock letters. Designers of new display faces distorted the Bodoni and Dido types, making them larger and blacker. These type designs, called Fat Face, are now recognized as quintessentially Victorian. Wood engravers followed the taste for ornate elaboration and applied shadows, outlines, and embellishments to letterforms. The Egyptian faces joined the Fat Faces as one of the most original typographic forms of the century. The distinctive Victorian style of layout – extreme variations of type size and weight crammed within the page format was an invention of expedience, allowing the printer to utilize every inch of precious space. Chromolithography with its hand-drawn lettering, was a major source of inspiration and competition for type foundries and letterpress printers. Setting type by hand and then redistributing it into the job case remained a slow and costly process. By the middle of the nineteenth century, presses could produce twenty- five thousand copies per hour, but each letter in every word in every book, newspaper, and magazine had to be set by hand. Dozens of experimenters worked to perfect a machine to compose type, and the first patent for a composing machine was registered in 1825. By the time Ottmar Mergenthaler perfected his Linotype machine in 1886, about three hundred automatic typesetting machines had been invented that tried various methods. Mergenthaler’s breakthrough involved the use of small brass matrixes with female impressions of the letterforms. Each time the operator pressed a key on a keyboard, a matrix for that character was released from a tube, it slid down a chute and was automatically lined up with the other characters in that line. Molten lead was poured into the line of matrixes to cast a line of type. This technology facilitated the explosion in the amount of printed material. Photography and graphic communications have been closely linked beginning with the first experiments to capture an image of nature with a camera. The Frenchman who first produced a photographic image (1826 Joseph Niepce) was a lithographic printer. He began his research into photography by seeking an automatic means of transferring drawings onto printing plates. In partnership, with Niépce, Louis Daguerre refined the early photographic process. In 1839 Daguerre announced that he had invented a process called the Daguerreotype. The Daguerreotype was very popular during the Victorian age and created a demand that added to the push for the development of photography. Throughout the 1800s, experiments in photographic technology continued to improve until towards the end of the century it finally became possible to merge photographic processes with printing. In 1880, the New York Daily Graphic printed the first reproduction of a photograph with a full tonal range in a newspaper. It was printed from a halftone screen invented by Stephen Horgan. The screen broke the image into a series of minute dots whose varying sizes created tonal values from pure white paper to solid black ink. The first photomechanical color illustrations were printed in the 1881 Christmas issues of the Paris magazine L’llustration. Complicated and time-consuming, photomechanical color separation remained experimental until the end of the century. What did the Victorians like? What kind of furniture, silverwork, jewelry, wallpaper, and glass did they buy for their own homes? The Victorian years, which lasted for most of the 19th century and a few years beyond, divides into several periods. 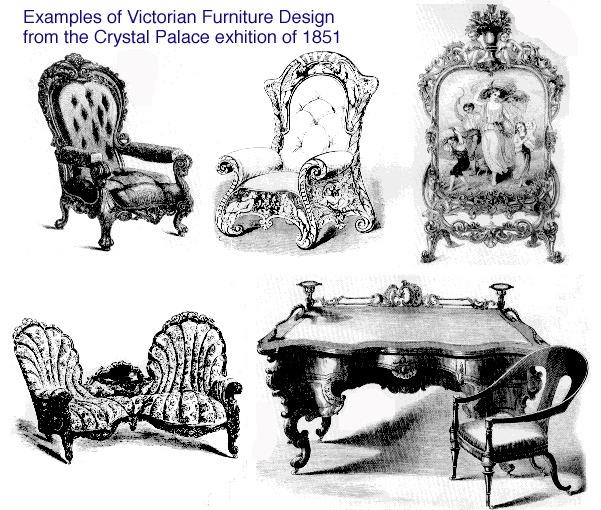 The early part of Victoria’s reign saw interest in a medieval or Gothic Revival in all aspects of architecture and design. After the Great Exhibition of 1851, tastes ran to exaggerated embellishment of virtually every article in the Victorian home. Victorian era printed design did not reflect a philosophy, instead the style was a celebration of the evolving technologies of mass production. Then, from the 1880s onward, a series of reactions against High Victorian taste took place — Aestheticism, Art Nouveau, Japonisme, the Arts and Crafts movement, the Celtic Revival and the Liberty style, and finally Art Deco, which reached its height much later, in the 1930s and ‘40s. The nineteenth century was the turning point for technical development in printing. At the beginning of the century, books with color plates were hand-colored by artists, using techniques dating back to the Renaissance. A hundred years later, the photo-reproductive techniques, mechanization of typesetting, and the steam-driven printing press introduced processes which would be used until the computer revolution in another hundred years. More about the industrial revolution from Joseph A. Montagna: http://www.yale.edu/ynhti/curriculum/units/1981/2/81.02.06.x.html, Yale-New Haven Teachers Institute (2012). Thanks, Renée! I have been researching the styles for a project, but in looking for inspiration I’m finding much of the “charm” is also poor design! I became curious about whether there is a place to find truly exceptional examples. I think of Currier and Ives as being publishers of landscape and livestock illustrations, rather than having any typographic or other graphic design contributions… but I will dig deeper. I’ll also follow your lead on Punch Magazine as a resource. Hello Penina, The Victorian years are known for the industrialization of – well, nearly everything. Individuals were rarely credited for their work, rather it was the printing shops that took credit for their employees works. Some exceptions existed – one was the printshop owned by lithographers Currier and Ives, and another was Punch Magazine whose co-founder was the illustrator and engraver, Ebenezer Landells. The profession we know as “graphic design” didn’t emerge until late in the 1800s when the Arts & Crafts Movement took off in the UK and the US and painters such as Jules Chéret and Henri de Toulouse-Lautrec began creating lithographic posters. Thanks for this post! This is the most thorough overview of the period I’ve come across so far. I have also been hoping to find names of notable individual graphic designers from anywhere in Europe or the U.S. Did you happen to come across any? Very nice work and well researched! Thank you Marilou, that’s very kind of you to say. Ah, I see, I didn’t know the term was in common usage elsewhere than the former British empire, since she was our Queen. Whenever we hear “Victorian” we assume it’s about us! I love American Victorian houses btw, wish we did have more verandas but the air quality was so poor here at that time (think modern Beijing) that you wouldn’t want to sit out! Hello Woofbarkyap. Most of the info in my blog is from a North American point of view – because that’s where I was born and raised. There was a strong Victorian movement in North America although it did begin in England, as you know. Its interesting to know that English Victorian architecture is noticeably different. Thanks for the comment. Great article but the house you show is American, not English. Typical English architecture of the Victorian period is quite different. For one thing, we mostly build in brick or stone, and verandahs are really quite rare.